The new exhibition at Jewish Museum London, Jews, Money, Myth, is opening at a time when antisemitism is rarely out of the news. Britain’s Equality and Human Rights Commission has announced it is “engaging” with the UK's Labour party out of concerns that there may have been discrimination on the grounds of ethnicity and religious beliefs. Labour Members of Parliament have left the party citing its failure to deal with antisemitism. Meanwhile the Labour-supporting Momentum movement has felt the need to create a video to educate its membership on the conspiracy theory that wealthy Jews—in particular the Rothschilds—control the world. Of course, this is not just a British problem. In France, protesters have made much of the fact that President Macron once worked for the French bank Rothschild and Cie Banque. There is plenty of international vitriol directed at the investor George Soros, caricatured as another global Jewish overlord. Communicating all this hatred and suspicion is a painfully familiar collection of images, which has had remarkable longevity. At the museum, we hold collections that tell the history of Jews in Britain. We also aim to provide all visitors with a positive experience of the Jewish religion and culture and to bring them into our discussions. In Jews, Money, Myth, we have collaborated with the Pears Institute for the Study of Antisemitism at Birkbeck, to explore a troubling history of anti-Jewish stereotypes around money. We hope not just to communicate that antisemitic tropes have a long history, but also to empower visitors to identify and challenge them, even to the point of reconsidering their own language and choice of images. Images are key to approaching this subject, since much of it developed through visual interpretations of the New Testament at a time of low literacy. Artists only began to distinguish Jews from Christians from the late-11th century. Initially they can be seen with beards and pointed hats, carrying scrolls. Half a century later, they acquire distorted faces. By the 13th century they are also carrying moneybags, shown clinging to the material world and denying spirituality. As the historian Sara Lipton explains in the publication that accompanies this exhibition, the aim was to encourage Christians to avoid sin rather than hate Jews, but history tells us that this caricature has persisted and inspired murderous hatred. In the exhibition, some of the later images, such as those from Nazi propaganda, reveal a clear political agenda. Remarkably, the distorted faces and clutching of moneybags are recognisable from antisemitic caricatures centuries before. A recurring theme shows how anti-capitalist analysis can veer—consciously or unconsciously—into antisemitism, where the problem is shown to be the Jewish banker, rather than all bankers. A frightening 19th-century image Die Generalpumpe (the universal lender) shows a grotesquely caricatured Jew portrayed as a monstrous engine pumping money around the world, with tentacles extending to control monarchs and ministers as far away as Spain and Egypt. A recent mural by the US artist Mear One, which was removed from a wall in East London, featured bankers—some with exaggerated facial features—playing monopoly on the backs of workers. Sometimes Jew hatred is hard to see. Perhaps an even greater danger comes when such imagery becomes "natural"—an obvious and accepted way to represent Jews, regardless of reality. Some of the objects in our collection are quietly sinister: a family board game from 1807, called The New and Fashionable Game of the Jew, features a central illustration of an opulently dressed bearded figure smiling while hoarding money. When players land on the number seven, they "must deposit counters on the Jew", which are only released when someone throws a double six. The image and the game together show how acceptable it was to portray Jews as purely interested in collecting money. Thankfully, there are artists who take a different angle. 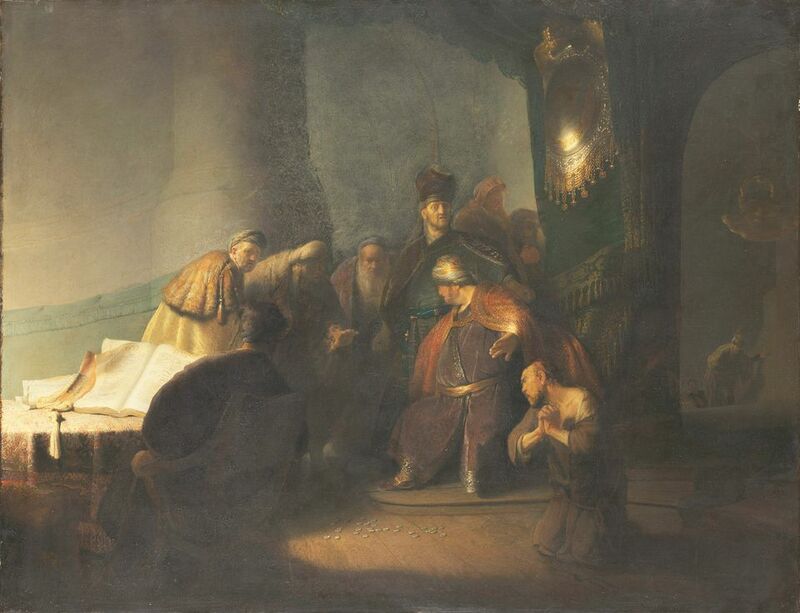 Among various representations of Judas, a key figure in the development of the negative association of Jews with money, we will be showing a rarely seen work by Rembrandt van Rijn from a private collection, Judas Returning the Thirty Pieces of Silver (1629). Rembrandt’s view of Judas as a complex man with a troubled conscience, unsuccessfully attempting to return his money, contrasts with earlier depictions that show the moment when he takes the coins. We have also turned to contemporary artists to provide a fresh perspective on a historical exhibition, and a troubling conversation. Jeremy Deller and Doug Fishbone have both created video works for this exhibition in response to its themes, and Fishbone will also give a performance. We feature Roee Rosen’s retelling of Shylock’s story—the Jewish moneylending character in William Shakespeare's play The Merchant of Venice—and a selection of Ryan Gander’s works, which question our own instincts around money. We want to show visitors that the negative myths around Jews and money have a history, in which artists have played their part, and continue to do so. By bringing these materials together, we are aiming to shine a light on unconscious bias, so that the familiar caricatures of the money-hugging Jew, and the rich, world-dominating Jew, never look "natural" again. • An illustrated book accompanies the exhibition, with contributions from international scholars and artists exploring some of its key themes, including the literary historian and author Stephen Greenblatt and the artist Roee Rosen. The exhibition has been developed by the Jewish Museum London in collaboration with the Pears Institute for the study of Antisemitism at Birkbeck, University of London.